Hail storms can strike at any time, and while there are ways to minimize the damage to your property, large hail will inevitably cause some damage. Just recently, a storm dropped baseball-sized hail onto the properties of several Dallas/Fort Worth area residents, leaving them with severely damaged homes. Most metal roofs are highly impervious to damage, but they’re not completely indestructible. Even if you have an incredibly durable metal roof, it’s a good idea to give it a once-over to look for hail damage after a storm. Damage to metal roofs is fairly easy to spot. All you need to do is look for dents in the panels and ridge caps. Some damage to shingles is obvious, but quite often, it’s not. Here are the things to look out for when determining if your shingles are damaged. Broken or missing shingles. If any shingles are missing or broken, you’ll obviously need to get them replaced. Cracked shingles. Look at the shingles a little closer to make sure that none of them are cracked. 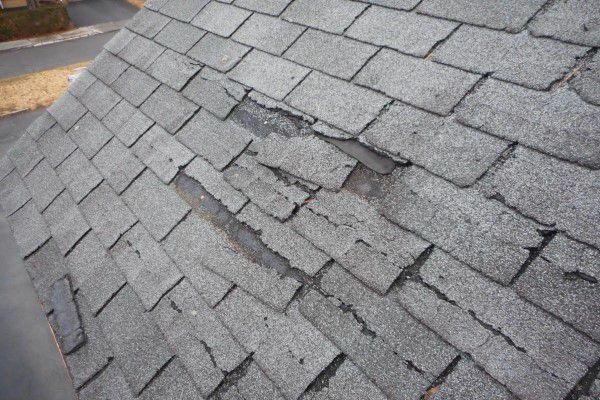 Even if no part of the shingle broke off completely, a cracked shingle is a compromised shingle that can let water seep into your home. It may be difficult to spot cracks on clay and asphalt shingles if they’re dark in color. Wood shingles will often split down the middle when damaged. Dents. Some dents are large and easy to see; others are small and hard to spot. To find smaller dents, you’ll need to look very closely and maybe even run your hand over the shingles to feel for indents. Missing asphalt granules. If you look closely at your asphalt tiles, you may spot missing granules, exposing a dark surface underneath. That dark material is not part of your shingles – it’s the underlayment. An underlayment is made out of felt or fiberglass and is not made to protect your roof on its own. Over time, missing granules and an exposed underlayment will allow water to seep through. Don’t forget to follow the above steps to check for damage to your roof caps as well. Since gutters and roof vents are usually made out of metal, you can usually spot damage the same way that you would on a metal roof – look for dents. On any kind of gutter, look to see if it’s become detached from the roof at all or seems to be sagging. These are signs that the gutters need to be replaced or repaired. Has your roof been damaged by hail? Do you want to get an expert to inspect the roof for you? In either case, call Acme Roof Systems. They’ve got over 20 years of experience inspecting and repairing hail-damaged roofs.